Clownfish are among the easiest saltwater fish to keep in an aquarium. They still require more complex care than most freshwater aquarium fish. However, their hardiness makes them an ideal "beginner" fish for someone starting out with saltwater aquariums. Clownfish require a tank with a capacity of at least 30 gallons. The tank should have plenty of hiding places for the fish to help them feel safe. 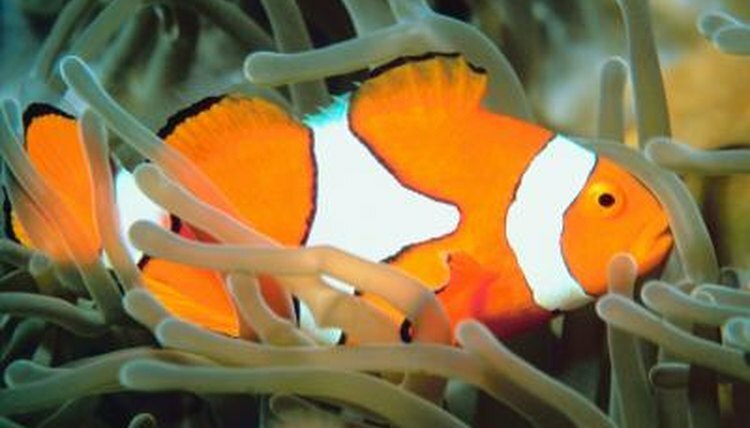 Clownfish can thrive in both fish-only and reef setups, though the former is much less of a challenge for beginning saltwater hobbyists. Their water must stay between 74 to 78 degrees Fahrenheit and have a specific gravity of 1.020 to 1.024. Clownfish will eat most fish foods. They will even eat flake food, which is unusual for a saltwater fish. However, you need to make certain they get a varied diet. Include live and frozen fish foods, like brine shrimp and krill. Most pet shops carry these types of food. They also need some vegetables in their diet like spinach and nori. You can get nori at specialty grocery stores. A varied diet ensures that clownfish get all of the nutrients that they need. Clownfish adapt well to a "community" style aquarium, an aquarium with small, peaceful fish. Most clown fish will not harm other fish, but are small enough that they could be in danger from larger tank-mates. Clownfish will also leave invertebrates alone, making them good candidates for a reef tank. Only one clownfish, the maroon clownfish (Premnas biaculeatus) can be aggressive, and should only share a tank with large, hardy fish of about the same size (four to six inches). Clownfish do not need anemones to survive or even thrive. In fact, anemones can be more delicate and difficult to care for than the clownfish themselves. Different species of anemone have their own specific requirements for things like lighting, feeding and substrate. Some hardier anemones that host clownfish include the beaded anemone (Heteractis aurora) and the adhesive anemone (Cryptodendrum adhaesivum). A few can sting humans, so always wear gloves when handling anemones. Sometimes, in the absence of sea anemones, clownfish make take certain corals, like Xenia polyps, as hosts.